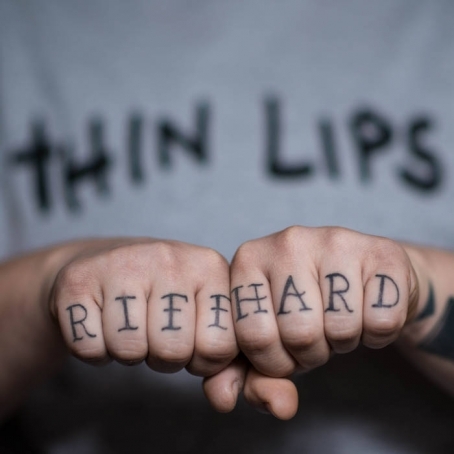 Tonight at Everybody Hits is the long-awaited release show for Thin Lips’ debut LP Riff Hard, coming out via local tastemakers Lame-O Records. Thin Lips are a venerable supergroup of longstanding Philly stalwarts who have hit a sweet spot of triumphant pop rock and confessional, introspective lyrics without sentimentality. Chrissy Tashjian, formerly of Dangerous Ponies and The Bee Team, captains this ship with her commanding, casual, and versatile vocals. The hard riffs are largely courtesy of longtime bandmate Kyle Pulley (ex-Dangerous Ponies) and Chris Diehm, a punk-rock lifer who cut his teeth in Lancaster’s 1994! before coming to Philly and lending his talents to Thin Lips, as well as Year Of Glad. The band is filled out by Mikey Tashjian (The Superweaks, ex-Dangerous Ponies), who shows his ability to shift rhythms and help craft intriguing songs, while maintaining a not-too-serious rock 'n' roll sheen. Celebrating with the Lips will be Casey Magic, Lame-O labelmates Lowercase Roses, folky psych rockers Pine Barons, and Pure Pop, a “new pop-punk trio comprised of Lame-O, Superweaks, and Modern Baseball angel babies.” Everybody Hits, 529 W. Girard Ave., 8pm, $5-$10, All Ages - Adam G.
This is such sad news. 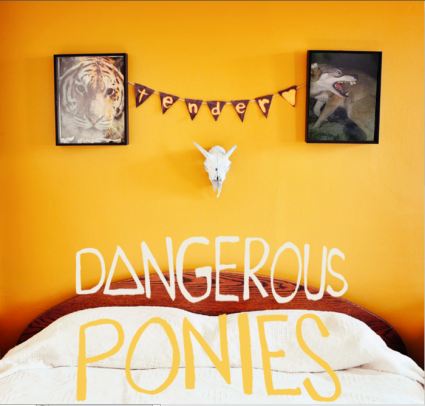 Dangerous Ponies just announced that they’ll be calling it quits. We’ve had the honor to share such momentous occasions in Deli Philly history like anniversaries and ringing in this past New Year with these wonderful folks. We are obviously going to miss seeing their joyous performances on stage together. Below are a few words from the band. we have some news to share. we will be playing our final show on May 26th in Philly. These last four years together have been a beautiful and wild rollercoaster and we are all the better for having met all of you. Thank you for the couches, floors, and porches you shared with us, for eating endless breakfast burritos with us, for showing us the coolest parts of your towns and the secret swimming holes that only you know about, for thrift shopping with us, for getting on stage and playing with us, for telling your friends about us, but most importantly thank you for constantly supporting our music. It’s a dream to be able to travel the country with a group of your friends and play shows to keep the van moving. so seriously..thankyou. It’s currently unclear as to what will happen next. You can find Evan playing with Holy Death and Kyle is always over Headroom Philadelphia recording bands. and Chrissy I’m sure will start a new project soon. So stay tuned. and hopefully you can make it on the 26th. 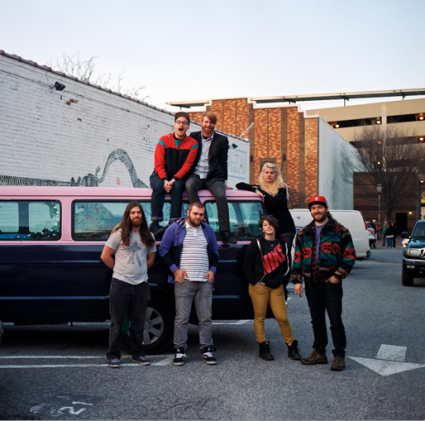 You can catch Dangerous Ponies’ final performance on Sunday, May 26 at The Barbary with Lemuria and Omar. Much love for DP! Dangerous Ponies’ latest release, a four-song EP entitled Tenderheart, emphatically meets the expectations of their fans. Tenderheart is a systematic combination of fresh rocking, dance-inspiring, indie pop led by the supreme vocals of Chrissy Tashjian and the band’s innate ability to construct and balance complex musical compositions, stacking tight layers of sound, with the help of producer Joe Reinhart, while retaining a clean crispness. Seamlessly leading into “Sparks,” rumbling drums and claps form a base, but the song takes an unexpected route when a bright choir-esque vocal teams up with Tashjian’s lead, developing an airiness before yet another transition - one from keys into guitar. A chunky bass/guitar groove thrusts into a dual laser beam guitar riff. “California” is a microcosm of the band’s ability to blend an array of styles into a dense rich package. What begins as a poppy vocal song using a twangy guitar and a snap/pop driving percussive backdrop quickly changes shape morphing into a fuzzed-out guitar lick; then turning into a pulsing bass/key scenario nod to The Clash. Finally, the two-worlds meet as a twangy/fuzz guitars rip through, and the song comes full circle closing out with a polished choral/lead vocal marriage. Tenderheart rounds itself out with anthemic “Dogfite.” Similar to its predecessors, the closing track shape-shifts as it moves. Beginning at a precise jogging pace that puts emphasis on the groove, but after coasting down the road, it speeds up merging into a raunchy fuzz-guitar explosion, and then steps back with as a slick lick and drum beat creating a path for Tashjian to lament, “Everything in you, is in me too/the nature of us we are so free.” And as the full instrumental artillery reemerges, the rest of the band’s wails of “Are we strong enough?” go head to head with the lead vocals, providing the song and Tenderheart, as a whole, with a dynamic and powerful ending. 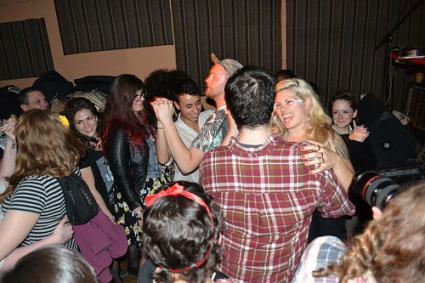 Dangerous Ponies celebrated the release of their new EP Tenderheart this past Friday at MilkBoy Philly with a killer set and a packed house of adoring fans. Also along for the ride were Slutever, Desert Noises and Starlight Girls. You can check out our pics from the evening HERE.